GOVERNMENT OF KERALA OFFICE OF THE COMMISSIONER FOR ENTRANCE EXAMINATIONS HOUSING BOARD BUILDINGS, SANTHINAGAR, THIRUVANANTHAPURAM – 695 001. 1. 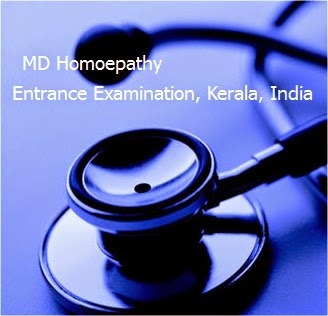 Applications are invited for the Entrance Examination for admission to M D Homoeopathy Courses for the year 2014-'15 in the Government Homoeopathic Medical Colleges at Thiruvananthapuram and Kozhikode. (ii)Academic Qualifications: BHMS Degree (Direct/Graded) or its equivalent, declared thereto, by the Central Council of Homoeopathy. Cand idates who have completed the prescribed internship before the date of interview for allotment alone are eligible for admission subject to the condition that they should produce the Medical Council Registration Certificate at the time of interview for allotment . Candidates who have passed the final year examination with more than three chances are not eligible for admission. (iii) Age: The candidates otherwise eligible for admission should not be more than 45 years as on 01.01.2014 subject to a relaxation of a maximum of five years in the case of SC/ST Candidates and Teachers of Homoeopathic Medical Colleges. 3. Selection and Entrance Examination: Selection of Candidates except for the seats reserved under Rural Service Quota and for Teachers working in the Private as well as Government Homoeopathic Medical Colleges in Kerala will be ma de on the basis of the rank in an Entrance Examination to be conducted by the Commissioner for Entrance Examinations ( CEE ) at Thiruvananthapuram on 31.08.2014 . The Entrance Examination will consist of two papers, each of two hours duration and each Paper having 150 Objective ( Multiple Choice) type question s . Paper-I will consist of Pre-clinical and Para-c linical subjects and Paper-II will consist of Clinical subjects. 4. 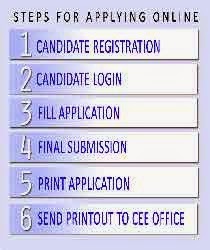 Online Application form & Application Fees: All Candidates seeking admission to the course shall apply online through the website www.cee.kerala.gov.in from 09.08.2014 to 3.00PM of 16.08.2014 . Separate Applications have to be submitted by General Quota and Service Quota candidates. The Prospectus for this course can also be downloaded from this website. The application forms and prospectus will not be available from the colleges or from the office of the Commissioner for Entrance Examinations. Candidates should take a printout of the online application submitted, put the signature wherever necessary and should affix a photograph attested by the Gazetted officer . General Quota candidates will have to remit the Application fee of Rs.800/- (for SC/ST candidates Rs.400/ -) in any branch of State Bank of Travancore using the Bank Chalan available with the printout of the online application submitted . Candidates outside Kerala can remit the required fee by way of a Demand Draft for Rs.800/- drawn from any nationalized bank in favour of the Commissioner for Entrance Examinations, Thiruvananthapuram payable at Thiruvananthapuram . The application fee for Service Quota candidates is Rs.800/- and can be remitted by way of a Demand Draft in favour of the Principal and Controlling Officer, Government Homoeo pathic Medical College, Thiruvananthapuram , payable at Thiruvananthapuram . The application fee once remitted will not be refunded on any account. 5. Submission of Application: Those candidates, [except Service candidates] whose selection is based on the Entrance Examination should forward the printout of the online application submitted along with supporting documents mentioned in Clause 10 of the Prospectus and the Original Bank Chalan / Demand Draft to the Commissioner for Entrance Examinations, Housing Board Buildings, Santhinagar, Th iruvananthapuram, Kerala – 695 001 , either by Registered post / Speed Post / Hand delivery, so as to re ach him on or before the last date of receipt of application. Candidates applying for the seats reserved under Rural Service Quota and for Teachers Quota in Government and Private Homoeopathic Medical Colleges should forward the printout of the online submitted application routed through their Heads of Departments/Institutions with necessary No Objection Certificate furnished in the application form and the application fee of Rs. 800/- by way of Demand Draft (drawn from any Nationalized Bank, in favour of the Principal and Controlling Officer, Government Homoeo pathic Medical College, Thiruvananthapuram, payable at Thiruvananthapuram) to the Director of Homoeopathy, East Fort, Thiruvananthapuram -695 023 [ in case of Rural Service Quota ] or to the Principal and Controlling Officer, Government Homo eopathic Medical College, Iranimuttom, Thiruvananthapuram, Pin-695009, Kerala [in case of Teacher’s Quota] on or before the last date of receipt of application. 6. Last date and time for receipt of applications: All Candidates including those applying against seats reserved for Teachers/Rural Service Quota should forward the printout of the application and supporting documents to the respective authorities so as to reach them before 5 pm on 16.08.2014 . Late applications including those brought after 5 PM on 16.08.2014 will not be accepted . The CEE or other officers will not be responsible for any postal delay. 7. Issue of Admit Cards: The Admit Cards for the candidates appearing for the Entrance Examination will be available online in the website www.cee.kerala.gov.in from 23.08.2014 onwards. The candidates may take the printout of the Admit Card which can be used for identification of the candidate in the examination hall. 8. Belated, incomplete, defective and wrongly addressed applications will be summarily rejected and no correspondence will be undertaken in this regard. Candidates will be allowed neither to include any information in the application form nor to submit any certificates/documents claiming reservation or any other benefits, after the submission of the application. Candidates must note that they have to obtain the required certificates in the respective format given in the Application form. The certificates, which are not in the format specified in the application form, will not be considered. 9 . The Commissioner for Entrance Examinations will conduct the Entrance Examination, publish the Rank list of candidates based on merit as assessed in the Entrance Examination and forward the same to Chairman and Convenor of the Selection Committee. The Selection Committee will make the allotments and forward the Select list to the Colleges concerned for making admission. 10. Candidates may go through the details given in the Prospectus for admission to the Post Graduate Homoeopathy Courses: 2014-15, approved by the Government of Kerala available in the web site www.cee.kerala.gov.in before filling the application form.